Author(s): Hongxia Cai, Zhijun Zhang, Guo-Yuan Yang. Neuroscience and Neuroengineering Research Center, Med-X Research Institute, Shanghai Jiao Tong University, 1954 Hua Shan Road, Shanghai 200030, China. Ischemic stroke is a leading cause of mortality and morbidity worldwide. 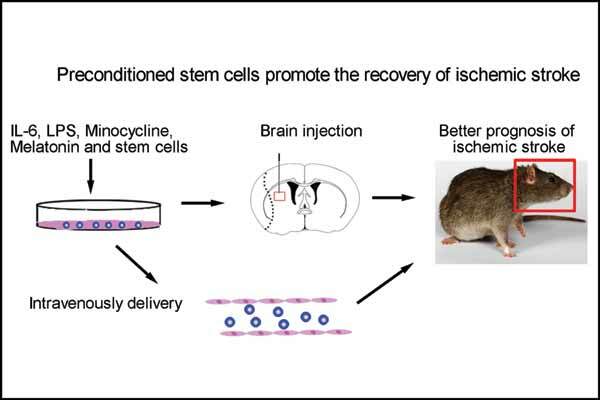 Numerous therapeutic studies, including stem cell therapy, have been explored in order to find the possible approach treating cerebral ischemia effectively. However, massive grafted-cell death and low survival rate made us pessimistic about the widespread application of stem cell therapy. The approach of preconditioning stem cells became an attractive option due to its high cell viability after transplantation. In this review, we focused on preconditioning stem cells via cytokines, chemical drugs and other factors including interleukin 6 (IL-6), lipopolysaccharide (LPS), minocycline, melatonin and hypoxia to increase grafted stem cell survival, proliferation, migration to ischemic peri-focal area and ultimately improve neurobehavioral outcomes. We explored the underlying therapeutic efficacy of preconditioning stem cells as well as possible mechanisms and potential risks. Finally, we discussed the prospects of the application of cell-based therapy in clinical patients with ischemic stroke. Keywords: Angiogenesis, ischemia, neuroprotection, precondition, stem cell. Affiliation:Neuroscience and Neuroengineering Research Center, Med-X Research Institute, Shanghai Jiao Tong University, 1954 Hua Shan Road, Shanghai 200030, China. Keywords:Angiogenesis, ischemia, neuroprotection, precondition, stem cell. Abstract:Ischemic stroke is a leading cause of mortality and morbidity worldwide. Numerous therapeutic studies, including stem cell therapy, have been explored in order to find the possible approach treating cerebral ischemia effectively. However, massive grafted-cell death and low survival rate made us pessimistic about the widespread application of stem cell therapy. The approach of preconditioning stem cells became an attractive option due to its high cell viability after transplantation. In this review, we focused on preconditioning stem cells via cytokines, chemical drugs and other factors including interleukin 6 (IL-6), lipopolysaccharide (LPS), minocycline, melatonin and hypoxia to increase grafted stem cell survival, proliferation, migration to ischemic peri-focal area and ultimately improve neurobehavioral outcomes. We explored the underlying therapeutic efficacy of preconditioning stem cells as well as possible mechanisms and potential risks. Finally, we discussed the prospects of the application of cell-based therapy in clinical patients with ischemic stroke. Cytokines in Colitis-Associated Cancer: Potential Drug Targets?